November 01, 2017, Rybinsk. 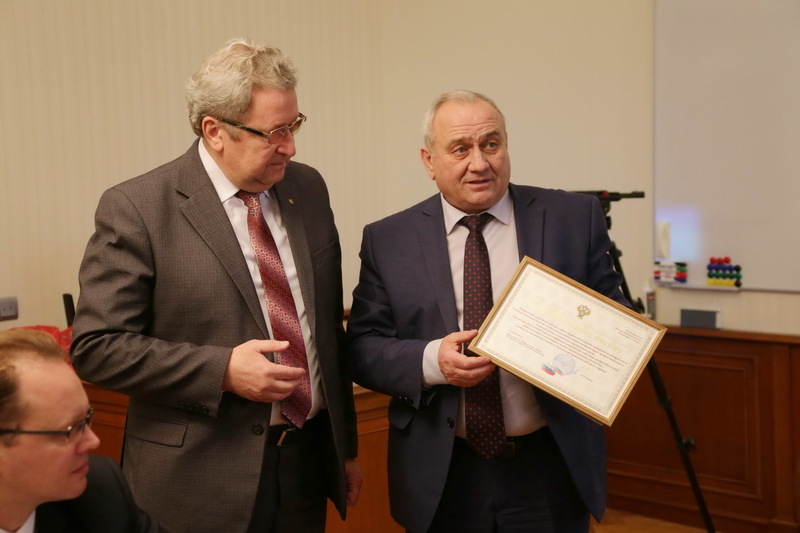 – UEC-Saturn became the first enterprise in the Yaroslavl region, that was granted with Grateful letter from Rosprirodnadzor and corroborated a high level of the systems of labour safety management and ecological management. 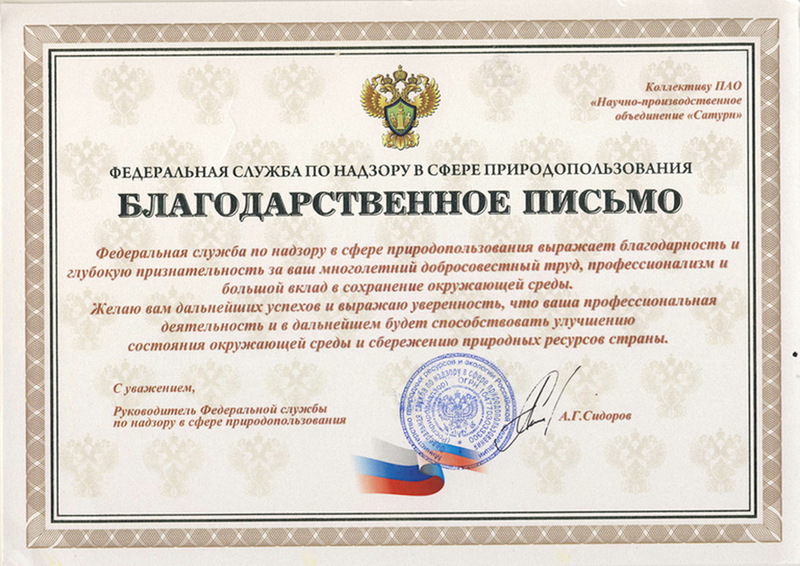 On October 31, 2017 Vladimir Shalaev, Head of Rosprirodnadzor Board in the Yaroslavl region, on behalf of the Russian Federation Federal agency on surveillance in environmental management sphere, presented Viktor Polyakov, Deputy General Director – Managing Director of UEC-Saturn, with a Grateful letter for substantial contribution into environmental conservation during his visit to the company. Year 2017 is announced to be a Year of ecology in Russia, which is illustrative of serious attention of the top management of the country to environment-oriented tasks solution. PJSC “UEC-Saturn” inherently supports this large-scale initiative with substantial actions creating powerful stock for further extension of the company. “We really set a high value of the company image in all fields of our activity and we do everything for the improvement of ecological state in our city, - said Viktor Polyakov, Deputy General Director – Managing Director of UEC-Saturn. - We are Rybinsk citizens, we live and work here and as nobody else we are concerned about safety of our city from ecological point of view. Today UEC-Saturn is evaluated as a company of European level – we work in accordance with international standards, and we always support and corroborate this status. Grateful letter to the address of the company staff - it’s an acknowledgement of our activity in the sphere of ecology and we are going to develop this activity with attraction of Federal resources”. 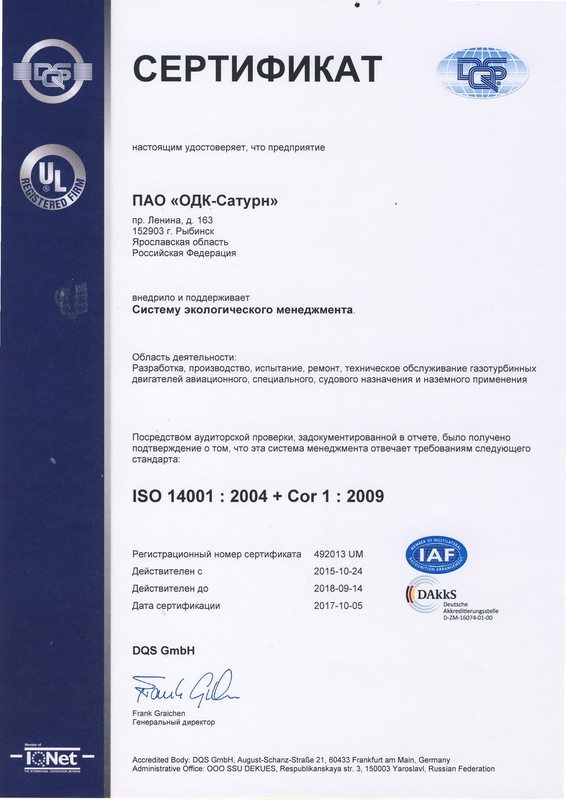 Another corroboration of a special attention from the management of the company to ecology and its personnel labour conditions improvement became a successful re-certification audit of labour safety management system and the second inspectorial audit of ecological management system held at UEC-Saturn in the end of September 2017. According to the results of the audits, Svetlana Ulyanova, Development Director of SSU DEKUES JSC, mentioned the efficiency of functioning of UEC-Saturn’s certified management systems: “Ecology and labour protection are integral parts of the company sustainable development, and these systems operate at UEC-Saturn not just in a worthwhile manner but also efficiently, and it is justified within many years. These results are achieved through a systematic work of all the personnel of the company and they are an effective tool with the help of which the company manages its activity and shows to its partners and concerned public its responsibility for ecological safety and labour safety”. 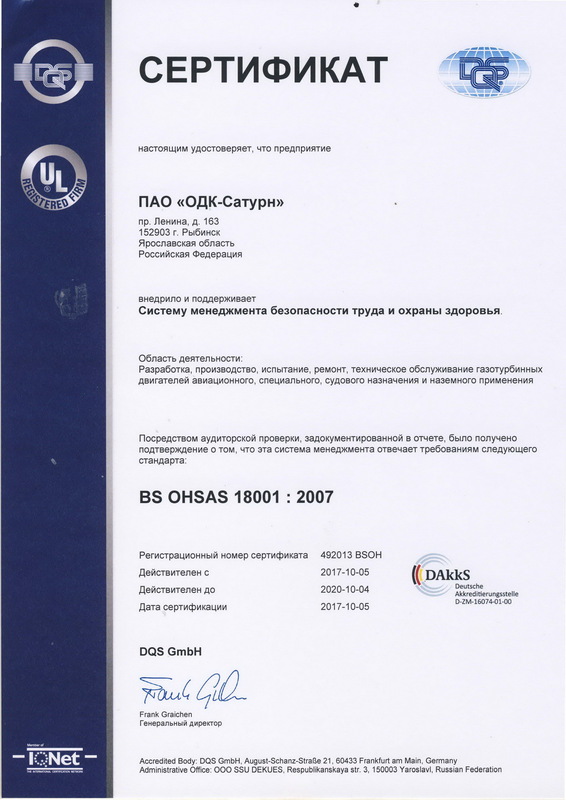 UEC-Saturn was granted with DQS certificate regarding compliance of UEC-Saturn labour safety management and health protection system to the requirements of international standard BS OHSAS 18001:2007 and DQS certificate regarding compliance of ecological management system to the requirements of international standard ISO 14001:2004. PJSC UEC-Saturn is an engine-manufacturing company specialized in the design and development, production and after-market support of gas turbine engines for military and commercial aviation, power generation and gas compression as well as for ships and vessels. PJSC UEC-Saturn is a part of United Engine Corporation (JSC) and is the leader of the Commercial Engines division, a business unit of UEC. 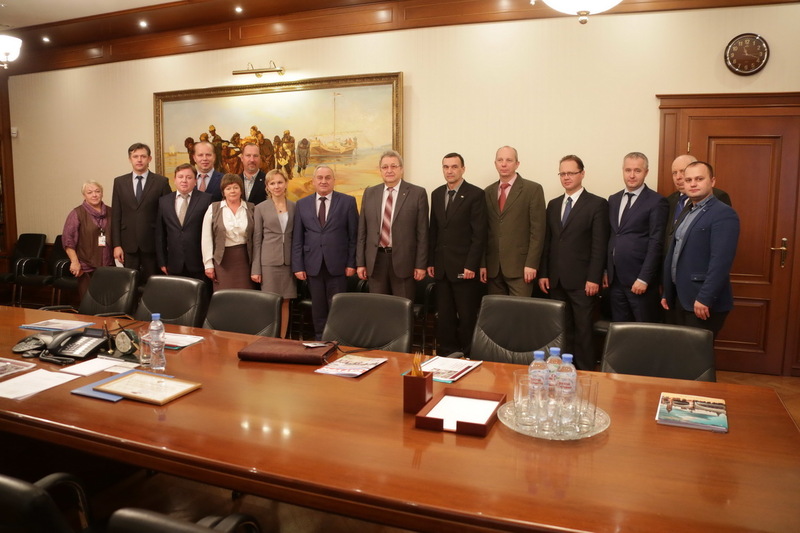 PJSC UEC-Saturn is a member of the all-Russian industrial association of employers “Russian Engineering Union”, the Yaroslavl regional office of the all-Russian public organization “Russian Engineering Union” is headed by V.Polyakov, Managing Director of PJSC UEC-Saturn. United Engine Corporation (JSC) (a Rostec State Corporation company) is an integrated organization specialized in the design and development, serial production and after-market support of engines for military and commercial aviation, space programs, the Navy as well as for the oil and gas industry and power generation. One of UEC’s prioritized fields of activity is the implementation of comprehensive programs of development of the industry’s companies by introducing new technologies meeting the world-class standards. 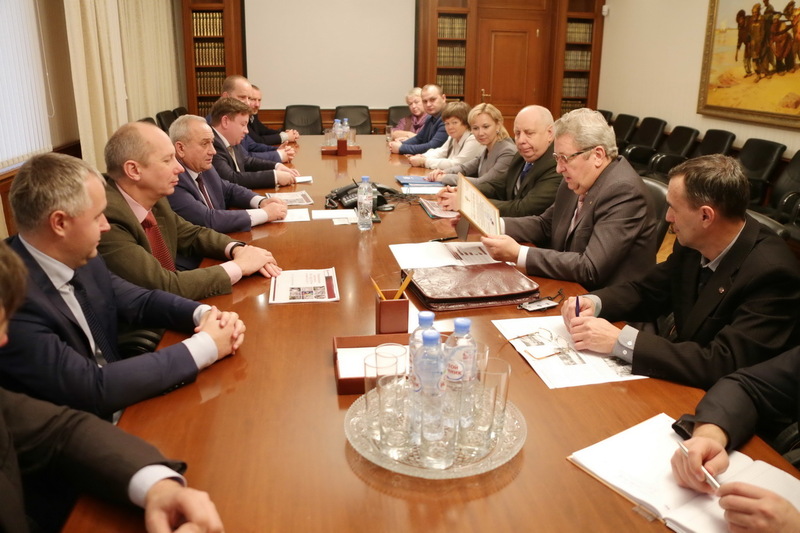 Rostec State Corporation is a Russian corporation established in 2007 in order to facilitate the development, manufacturing and export of high-technology industrial products of military and commercial application. The corporation comprises 700 companies, which form 11 defense-industrial and 3 civil industry holdings as well as 80 direct control companies. Rostec’s subsidiaries are located in 60 regions of Russia and deliver their products to over 70 countries worldwide.The Rostec portfolio spans such renowned brands as AVTOVAZ, KAMAZ, Kalashnikov Concern, Russian Helicopters, VSMPO-AVISMA, Uralvagonzavod and others. Rostec' s consolidated revenue reached 1 trillion rubles in 2016. Rostec's consolidated net revenue reached 88 billion rubles, and EBITDA reached 268 billion rubles in 2016. The corporation's average salary in 2016 amounted 44 000 rubles. Following Rostec's new strategy, the major objective of the Corporation is to ensure the technological advantage of Russia at the competitive world markets. 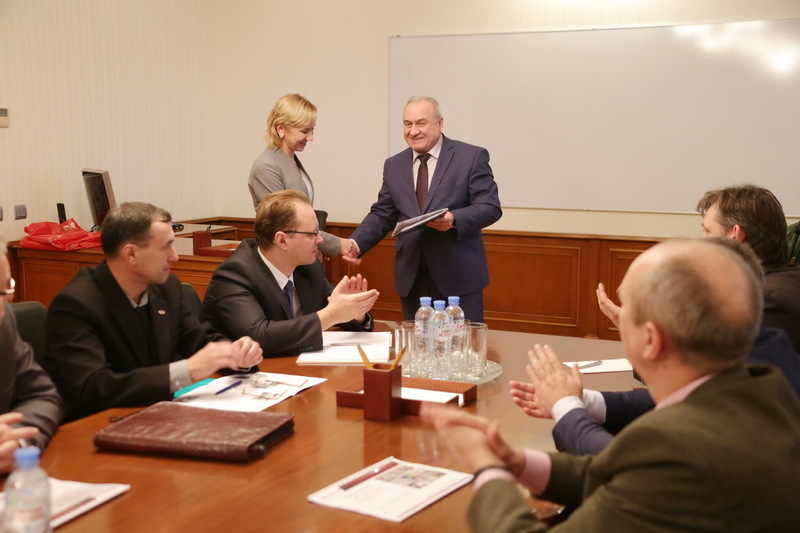 The implementation of a new technological wave and digitalization of Russian economics are among Rostec's tasks.